Leonard Thiessen was born and raised in Omaha, Nebraska. His family was small and his paternal ancestry had roots to the Swedish and German pioneer settlers of Grand Island, Nebraska. For a very short time, the family lived in Grand Island where, as a boy, Thiessen was employed in the mail department of The Grand Island Independent newspaper. His parents, Leonard Thiessen and Jean Louise Berg Thiessen, together with his mother’s favorite sister Wilhemina, were all involved in various creative endeavors and had a profound influence on Leonard’s development. His father worked in the printing industry and introduced the young Leonard to the trade. Jean was a talented self-taught artist in her own right who produced on-edge felt mosaics that are fine examples of early 20th century fiber art. (MONA has seven pieces of her work in its collection.) The Thiessens were involved in Omaha’s music, dance, and theater groups and deeply connected to the neighborhood Episcopal Church. They were not wealthy but had many friends in the community and had an impressive social calendar. Thiessen attended Omaha’s Miller Park Public School and St. John’s Protestant School and graduated from Central High School in 1919. His school years were privileged with experiences that helped to foster his development as an artist. While in high school, he decided to follow formal study in the visual arts and began to draw cartoons and illustrations for the school newspaper. During his teen years, he worked as an office assistant for an architectural firm in downtown Omaha, a job that offered a perk that proved helpful to his future employment. During his free time, Leonard would sit and read the collection of architectural books found in the office. After graduation he worked for the Omaha Bureau of Advertising and Engineering editing illustrations and photographs for an agricultural livestock catalog. He attended the University of Omaha (now University of Nebraska at Omaha) for three semesters in 1921 and 1922 studying journalism and fine arts and producing illustrations and graphic layouts for the University newspaper The Gateway. During this time, he worked as a gallery assistant for the Art Institute of Omaha which was located on the top floor of the old public library building designed by Thomas Kimball. 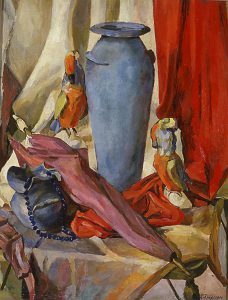 Thiessen became disillusioned with the University’s conservative art courses and left Omaha to continue his studies in the School of Fine Arts at the University of Nebraska in Lincoln from 1925 to 1926. He was not interested in “serious painting” and majored primarily in design and architecture. His professors were the artists Dwight Kirsch, Louise Mundy, Francis Martin (a contemporary of the portraitist J. Laurie Wallace), and Emily Burchard Moore. In the 1920s, Lincoln, Nebraska was an incredibly fervent environment. Some of Thiessen’s circle of friends and classmates included artists as well as writers and intellectuals among them Katherine “Kady” Faulkner, Louise Austin (who had studied in Munich with Hans Hoffman), Mari Sandoz, Weldon Kees, Loren Eiseley, and Dorothy Thomas. In the late 1920s, Thiessen pursued a highly successful commercial career as an interior designer and decorator with several design and architectural firms in Lincoln and Omaha. Additionally, he did freelance work and began to receive commissions as a mural painter. Later he studied at the museums of New York City, Boston, and Miami with his Aunt Wilhemina. In 1929, while on a trip to Paris, Thiessen learned of the stock market crash in the United States and decided to stay in Europe. He enrolled at the Académie de la Grande Chaumière in Paris where he studied drawing and painting for one summer and later moved to London to study at the Heatherly School of Art. While in London, Thiessen studied wood engraving and graphics. In 1932, he applied and was accepted at the Swedish Royal Academy of Fine Arts in Stockholm and studied with Otto Skold who later became the director of the National Museum at Stockholm. At the Academy, Thiessen studied the classical manner, graphic arts, and the traditional forms of fresco and mural painting. He described himself as a “designer of interiors and mural painter in the Middle West, U.S.” Taking several short breaks in between his studies to return to the United States, he finally received his diploma in 1938. While in Sweden, Thiessen made a trip to Tallin, Estonia, to sketch the local architecture. After returning to the United States in the late 1930s, he found that demand for interior decorators had fallen with the depression. He used his charm and talent to persuade the editors of the Omaha World-Herald and the Lincoln Journal Star to allow him to write an arts review column. He became the Omaha World-Herald’s first art critic and his now legendary column first appeared in 1939 and continued on and off for the next 30 years. He had exhibitions at Morrill Hall, University of Nebraska, Lincoln, in 1938 and Omaha’s Joslyn Art Museum in 1940. He also resumed his friendships with artist Milton Wolsky and Alysen Flynn. Later he accepted a position in Des Moines as Iowa’s State Director of the Federal Artists and Writers Program of the Works Projects Administration in 1941. The program employed 300 people and Leonard supervised over 100 individuals in eight departments. Thiessen left Iowa in 1942 to join the Army and was officially promoted to the Office of Intelligence in 1944. Because of his training in architectural design and graphic arts, Thiessen was particularly suited for the position of draftsman in the intelligence department. He studied and made reports of pertinent visual data, maps, and serial photos during the war. He was stationed in Kettering, England, the place that would become the subject of many of his works on paper. Thiessen lived in Omaha, Nebraska, for most of his adult life. He eventually converted two upstairs rooms of the now famous house on Stone Avenue for his studio. Artwork dominated both floors, much of it his own. Thiessen remained a bachelor his entire life, and had an amazing number of friends and colleagues from the various Nebraska arts communities. He was respected by many prominent Nebraska artists who honored him by making him the subject of their work including Kent Bellows, Bill Farmer, Larry Ferguson, Frances Kraft, Paul Otero, John Pusey, and John Thein. Leonard Thiessen died March 27, 1989. The Museum of Nebraska Arts holds 109 works by Leonard Thiessen in addition to archival material. Biographical information was derived from a variety of sources including unpublished biographical notes by William Wallis, 2001, and a recorded interview with Thiessen by Gary Zaruba, 1983. Note: When pronounced, the “h” in Thiessen is silent.